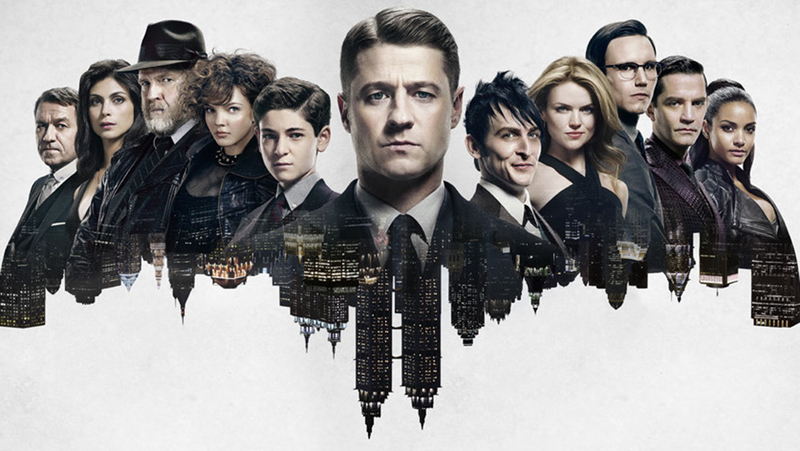 Gotham season 2 review… the good, the bad, and the OMG they didn’t do that, did they? Second season of FOX’s Gotham continued as my guilty pleasure program. There’s something about it that’s really good… but also something sort of awful. And I’m not just referring to Fish Mooney. I can’t explain in one sentence what I love about it. I mean… there are so many inconsistencies. But I’ve whined about that before- modern cell phones and 1980’s cars? Argh. The set decorators and prop people are smoking crack, aren’t they? Could they please start sharing with the audience? The costumes, however, continue to be lush and I want my entire wardrobe to be full of them. But it’s the cast and the characters portrayed that really do it for me. Despite the fact that the show wouldn’t pass the Bechdel test and that it lacks diversity (though it did a little better in season 2). I get tingles whenever Robin Lord Taylor (Penguin) or Cory Michael Smith (Nygma) are on screen. The performances they have created with those characters are phenomenal. Smith, in particular, showed depth and a lot of fun at the end of season 1, which he expanded throughout season 2. I would have enjoyed more of him towards the end of the season- I mean, he was there at Arkham, but he was by no means a focal point. Sidenote while I’m thinking about it- I am weary of next season because one thing I am starting to dislike is TOO many bad guys. I don’t mind the “monster of the week” with an over arcing bad guy but it looks like a whole slew of bad guys are loose now. Back to the boys… Taylor’s Penguin also had a lot of depth and growth in season 2. Especially due to the loss of both parents. It’s been a pleasure watching David Mazouz this season because in part, he went from little boy to young man. Growing several inches over the season so that now he towers over Selina. It’s cute. And Bruce Wayne has gone from lost little boy to someone starting on a path towards greatness. As long as he doesn’t get too distracted along the way. Or become a ritual sacrifice. Camren Bicondova (Selina) and Sean Pertwee (Alfred) also gave some fine performances in season 2. Half the time, Selina comes off like she doesn’t care about anything but herself- which is basically what a homeless, teenager would be like- but then she shows a selfless side. Particularly when it comes to Bruce. So cute! Ahem… Alfred does a great job appearing to just be a mild mannered butler. Until he needs to act in another manner and then… watch out! I don’t really want to run into him in a dark alley. Harvey Bullock has been my favorite since the first episode and if Donal Logue isn’t enough of an explanation, then we can’t be friends. I love the dry humor of the character. Galavan (James Frain) was a waste and annoyance until his final scene. Seriously. I love Frain, 99% of the time, but this character had no redeeming qualities and was just a scene filler in my opinion. And I know there are plenty that will disagree, that’s fine. This is my opinion. I also wasn’t a huge fan of Hugo Strange (B.D. Wong) and the goings on at Arkham. It felt… “flat”. Where was the excitement? The whizz bang? And would it have been too much to ask for a Tesla Coil? Sheesh. ← I watched BATMAN V SUPERMAN: THE ULTIMATE EDITION!